I recently met the perfect guy. Confidently cool, charming, even-tempered and agreeable, Vidur had me at hello, as they say. I can get over the fact that he is shorter than me and has fuller hair than I do. If only all of the guys I ever dated were as wonderful as this 15-hand Icelandic horse. Vidur is one of about 40 Icelandic horses at Gudmar Peturrson’s farm in Prospect, Ky., where I embarked on my latest Test Ride adventure—riding the tölt, the breed’s signature gait. Peturrson, a native of Iceland, imports horses from the island and then trains and sells them to Icelandic enthusiasts in the States. Like all promoters of the breed, Peturrson strives to maintain the purity of the Icelandic horse, particularly its gaits, which are not taught or altered through training. The Icelandic is a gaited horse that can perform a lateral four-beat single-foot gait called the tölt, in addition to the walk, trot and canter. Some also inherit a fifth gait known as the flying pace, a speedy lateral gait at which a horse can reach over 40 mph. According to Peturrson, the Icelandic is the only breed of horse that can naturally perform a diagonal and lateral single-foot gait under saddle. I was able to experience this unique ability on Vidur, a 9-year-old four-gaited gelding. After I spent some time getting acquainted with Vidur at the walk, Peturrson instructed me to move into the tölt by maintaining a steady, gentle hold on the reins and pushing Vidur into that contact with my lower legs. Instead of moving with the motion of the horse—as you would in the walk, trot or canter—the goal is to hold a still, upright posture. The tölt is basically a very quick walk. All four feet hit the ground individually at even intervals, producing a smooth and very subtle back-and-forth motion in the saddle, rather than the side-to-side rhythm of the trot. There’s almost no bounce to it. I liken it to the glide of a Nordic Track. In order to transition to the trot, all I had to do was lean forward and lower my hands. Other than that, Vidur responded to direct leg and hand cues—nothing overly complicated. Inside leg to outside rein and outside leg to canter still apply. 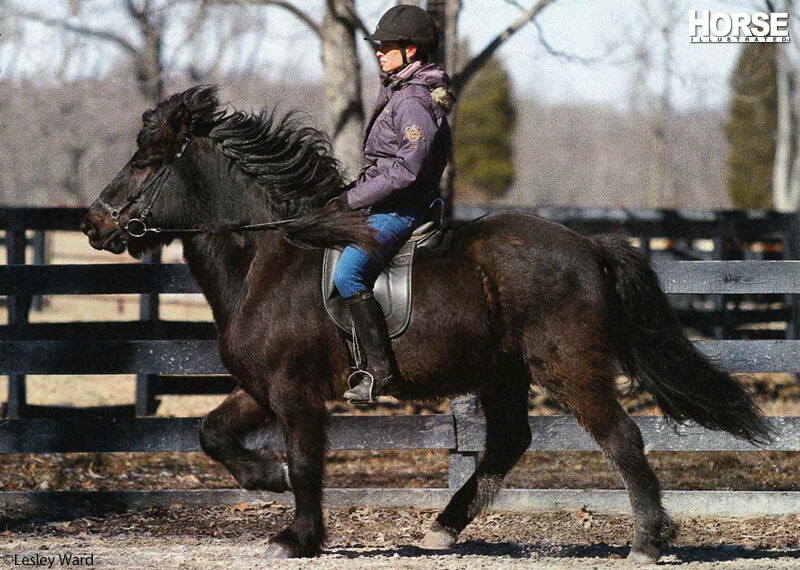 At Peturrson’s farm, training consists of natural horsemanship methods and classical dressage. He also travels the country to give clinics and demonstrate the breed at equine events through performances with his drill team, the Knights of Iceland. While you may see the occasional Icelandic at a local horse show, these horses are more often demonstrated at breed shows, where there are classes to showcase their gaits and characteristics. They are even evaluated on their hair! The Icelandic’s tail is full, and the mane is usually double-sided and as thick as it is long. One of Peturrson’s stallions once earned a 9.5 out of 10 for his luxurious locks. Icelandics are also ideal trail mounts, as they are very hardy and sound. At about 15 hands, Vidur is a bit tall for the breed, which usually averages 13.2 to 14.2 hands. However, even the smallest mature Icelandic can carry an adult male with no problems. Vidur’s dark bay coat is just one of the many colors seen in the breed, which has no restrictions on coat color—chestnut, black, dark brown and dun are most common, though. For me, the intrigue of the Icelandic horse goes beyond its temperament and amazing stamina to include everything from its history to the loyalty of its promoters. The breed is descended from horses that the Vikings brought to Iceland from Scandinavia in the 9th century. However, since about 1100, law has prohibited the import of any horses into Iceland, so the breed has remained very pure. It also means that once an Icelandic horse leaves the country, it can’t go back. This strict regulation is also partly responsible for the fact that there are very few equine diseases in Iceland. In the end, it wasn’t only Vidur who swept me off my feet and had me falling head over heels for the breed. I was awed by how the stallions at the farm were as calm and approachable as Vidur was, and all of the horses had a friendly, inquisitive nature. But it was the yearling that followed me around in one of the pastures that sealed the deal: I plan on adding one of these special equines to my dream stable someday. That is in addition to a Friesian, my personal favorite; a reining stock horse, which I fell in love with after test riding a reiner at the recent World Equestrian Games; and a Connemara, which I became enamored with during a trip to Ireland. This article originally appeared in the July 2011 issue of Horse Illustrated. Click here to subscribe! Interesting video! I hope that everyone had a great weekend,is having a great week,had a nice Memorial Day and I hope that they have another great weekend! Awesome! Is it just me, or does the Tolt look really similar to a Running Walk? Looks like the tolt is more of a running walk than a reagular walk? 40MPH?? Oh my they are so cute!! !